With this exclusive offer from Rewarding Times, we are offering a one night stay for two people in a Twin or Deluxe room at the luxurious 4* Deluxe Mount Wolseley Hotel, Spa and Golf Resort. Including a full Irish breakfast, a 4 Course early bird Dinner at the Fredericks Restaurant for 2. Rewarding Times customers well also enjoy full use of the Wolseley Spa Thermal Suite which includes the renowned Sabia Med Indoor Beach, Thermal Pool, Experience Showers, Foot Spa, Laconium & Steam Room, PLUS 20% off all Spa treatments booked in excess of € 80.00, as well as 10% discount on an exclusive selection of Elemis products. It doesn't stop there. Rewarding Times customers will also get 20% Discount on a round of Golf on the Championship Golf Course PLUS a 10% discount in the Wolseley Golf Shop, and 20% Discount on Mount Wolseley Signature Afternoon Tea. 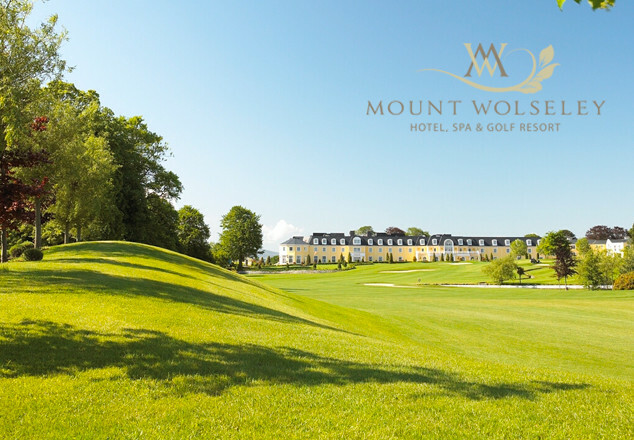 Mount Wolseley Hotel, Spa & Golf Resort is perfectly located for that well deserved break. From the grand staircase, sparkling chandeliers and glistening Italian Marble floors, this magnificent Hotel was designed for luxury. Reinvigorate your spirit in the Wolseley Spa, test your skills on the championship Golf Course or simply spend a leisurely afternoon curled up with a good book in our quiet room at the Library. The deluxe bedrooms and Suites at Mount Wolseley are spacious, airy and well appointed offering views over the countryside. Prepare to be pampered, re-awaken your senses, free yourself from the pressures of life and experience the Wolseley Spa, illuminated only by candlelight. Calming music and the world’s finest Elemis Beauty products await you. Mount Wolseley Golf Course designed by Christy O’Connor Jnr. The 18 holes are tree lined with large landing areas suitable for all standards of Golf with water in play on 11 holes. The relaxing environment coupled with the extensive luxurious facilities enable this regal property to offer the complete experience to our guests. Vouchers are valid from 20th of May to 28th September 2017. Full use of the Wolseley Spa Thermal Suite which includes the renowned Sabia Med Indoor Beach, Thermal Pool, Experience Showers, Foot Spa, Laconium & Steam Room PLUS 20% off all Spa treatments booked in excess of € 80.00. PLUS 10% discount on an exclusive selection of Elemis products.